Need to create a little atmosphere for your next backyard gathering? 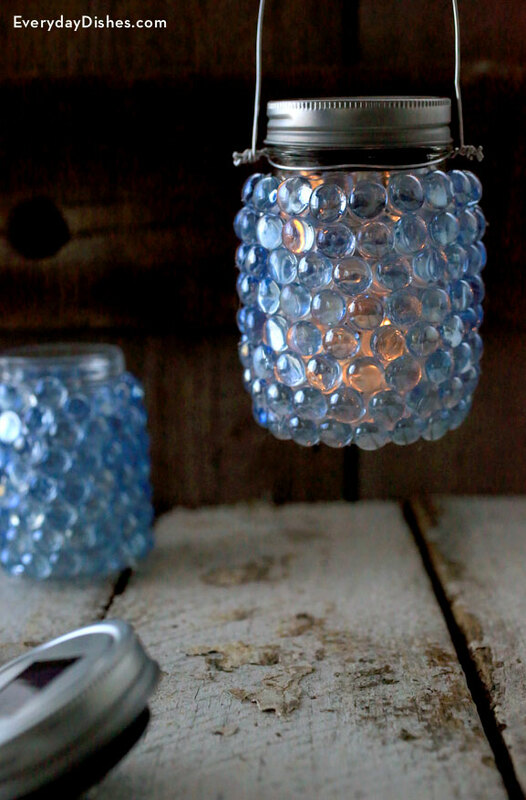 A DIY glass pebble lantern will easily do the trick as decorative stones reflect light from a solar-powered jar lid. This expensive-looking craft is actually pretty affordable, especially when using jars you already have at home. Glass pebbles with flat bottoms come bagged in a variety of colors that you can mix and match as you choose. Don’t be stingy with glue when placing pebbles onto the jar—you’ll need a generous amount to make them secure. Press firmly into place—one or two stones at a time—as hot glue dries very quickly. A solar-powered jar lid is a nifty item that takes the worry out of burning candles. A flip of the switch and it’ll automatically turn on in the dark and last up to six hours. Just be sure it gets plenty of daylight to recharge. 2 pieces wire, cut 6"
1 piece wire, cut 12"
Remove any labels from jar. Starting at the bottom of the jar, apply a generous amount of hot glue to the flat side of each stone and press firmly to adhere to the outside of the jar. Keep the pebbles as close together as possible to complete the row. Begin the next row by offsetting the pebbles so they do not line up with the previous row. Continue to go row by row, leaving just enough room to screw on the lid. Remove any stray strands of glue. Wrap one 6" piece of wire halfway around the neck of the jar then repeat with the other piece. Join wires by twisting ends together using pliers. Bend the 12" wire into a handle and attach to the jar. Follow instructions on lid packaging to charge light then turn on and hang. Round advanced-strength double-sided adhesives can work if you don’t want to use hot glue.